Mechanical and Electrical system design for the replacement of two large central air handling units serving the Robert C. Byrd Health Science Center North Tower Pharmacy Wing at West Virginia University. MEP system evaluations, feasibility studies and schematic design to define the project scope and to assist the owner in procuring funds for the project. With funding in place, our office began extensive site survey work to obtain all information required to replace the existing air handing units serving the pharmacy wing. On-site meetings and surveys continued through development of our MEP design documents. The project was successfully bid and awarded and our services were continued through construction administration with commissioning and start-up services also provided. 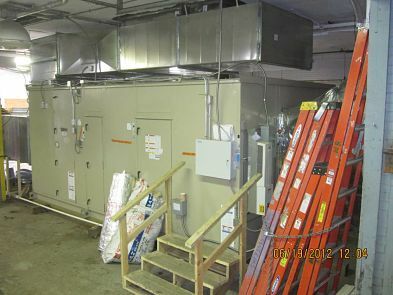 This project involved the replacement two air handling units with one new 70,000 cfm air handler. The system serves areas that require constant volume ventilation with reheat for temperature control. The owner requested that we increase the new unit capacity 25% over the existing capacity, which was accomplished by consolidating the two units into one, eliminating a service aisle and permitting the installation of a larger air handling unit. 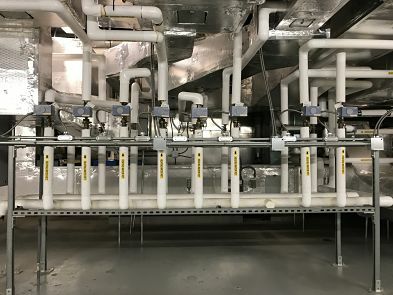 The replacement project also included design of new reheat coils, piping and controls to maintain temperature control zoning in the facility. New redundant, steam-glycol hot water heat exchangers were designed to provide heat for the new unit. 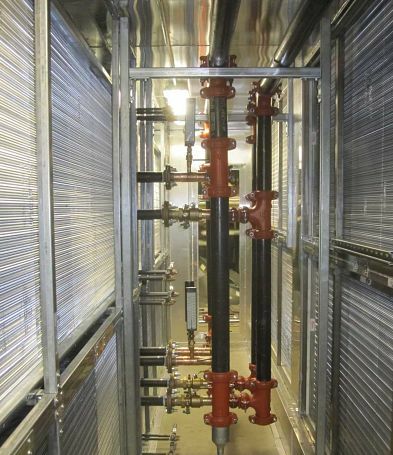 Cooling was provided by extension from the existing campus central chilled water system. There were two main challenges to overcome during our design process: The first was the university’s desire to minimize air handling unit downtime to one single weekend. This was accomplished by designing a temporary air handling system installed and made operational prior to demolishing the existing air handling units. The second challenge was rigging the new, large unit in place in the basement mechanical room with very limited access. We designed the units in segmented shipping splits, specific for the dimensions available to rig them into the basement, and each section was then field assembled in place.